Order your Jac Zagoory Designs Pewter Hummingbird Pen Stand today from FahrneysPens.com. Fine Pens, Refills & Luxurious Gifts – great prices & fast shipping. Here’s the perfect perch for your favorite pen. 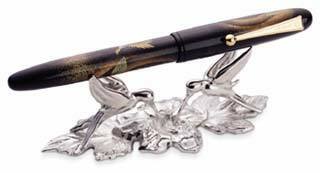 Crafted in solid pewter, the intricate detail of the two thirsty hummingbirds drinking nectar will delight you while displaying your pen. Made in U.S.A.